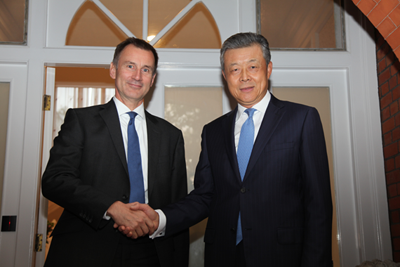 On October 4, 2017, Ambassador Liu Xiaoming met with Jeremy Hunt, Co-chair of the China-UK High-Level People to People Exchange Mechanism (HLPPEM) and UK Secretary of State for Health at the Ambassador's residence, and exchanged views with him on China-UK relations and people to people exchanges. Ambassador Liu noted that this year marks the 45th anniversary of China-UK ambassadorial relations. 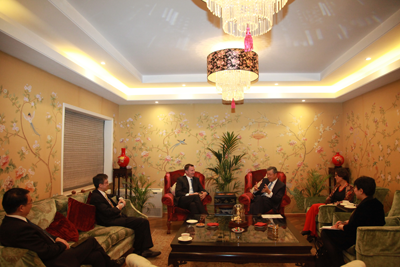 It is also a year for consolidating the "Golden Era" of China-UK ties and the 5th anniversary of the launch of HLPPEM. China-UK relations have maintained a strong momentum. The Exchange Mechanism has played a critical role in promoting the understanding, exchanges and cooperation between the people of the two countries. China is ready to work with the UK to make the fifth dialogue in December a success so as to further strengthen public support for China-UK ties and build an enduring China-UK "Golden Era". Secretary Hunt spoke highly of China-UK relations, saying that as the Co-chair of the UK-China HLPPEM, he is honored to witness and experience the "Golden Era" of China-UK ties and the growth of the Mechanism. The UK is willing to coordinate with China closely to ensure a complete success of the fifth meeting of the Mechanism and contribute more "golden fruits" to the China-UK "Golden Era".